It was the night before Christmas. Clarla and Fritz were sitting by the door of the kitchen. Their cheeks were red after throwing snowballs outside in the cold air. Their eyes shone brighter than the candles on the Christmas tree. They were chattering very excitedly about something. And the presents for Clara and Fritz were wrapped up and waiting for them on the kitchen table, just on the other side of the door. But the children were forbidden to go through the door until it was time. Time for presents. And as they couldn’t see the presents, they talked about them instead. And the children chattered on, until at last the door bell rang to announce that Godfather Drosselmeyer himself had arrived at the house. The children rushed to meet him in the hall. “Oh Godfather do please come into the kitchen so we can open our presents,” begged Clara. He was a funny-looking man, who wore a wig that sometimes slid half off his head. He had a faint mustache that had never grown very bushy, and his left eye was usually half closed. His hands and fingers were very tiny, but he was ever so clever with them – for Fritz was right; Godfather Drosselmeyer was a watch and clock maker and one of the cleverest who ever lived. But then perhaps Clara was right too. Maybe, just maybe he also could do a little magic. But in any case, his presents were always amazing and wonderful. It took a while to gather the whole family including parents, children, aunts, uncles and godparents. But at last it was time to open the presents. Sweets, dolls,and tin soldiers all emerged out of the wrapping, and even a Sultan’s palace beautifully carved and painted. They were exciting, lovely presents – and at last they were all opened – except that they hadn’t yet found a gift from Godfather Drosselmeyer. Clara understood that he was keeping back an extra special surprise for them, but Fritz thought that their godfather such a strange man, that perhaps he had forgotten all about Christmas this year. Both children were too polite to ask – but Clara gave her Godfather a gift of her own – a picture of a sugar-plum fairy that she painted herself. The old man was clearly delighted with it, he said. And she carefully unwrapped it. But it wasn’t just a doll. 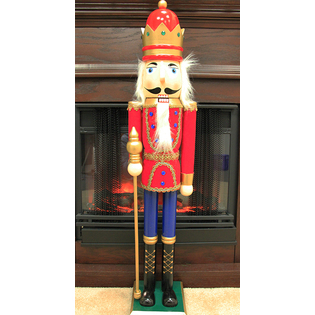 It was a nutcracker – painted to look like a soldier. The handles were legs, in bright red trousers, and with feet in shiny boots, and the part where you put the nuts to crack them looked like an oversized head with giant jaws. On top of its head it wore a tall fury hat. To tell you the truth, it was rather ugly. “Why thank you,” said Clara. “You’re not disappointed are you?” asked Godfather Drosselmeyer. “No,” she said. “I love the nutcracker-soldier because he’s funny.” And she gave her godfather a hug and a kiss. But Fritz did not like the nutcracker-soldier at all. He thought it was useless. Well almost, you could use it to crack nuts – and after dinner that’s what they did. Clara and Fritz sat under the Christmas tree and cracked walnuts in the mouth of the soldier. Clara wasn’t quite strong enough to break the shells, but Fritz found it easy. Until he tried to break open an extra hard nut. He squeezed and squeezed and squeezed until eventually – the nutcracker broke. One of its jaws came off, leaving the poor solider with half a mouth. “Oh no!” squealed Clara. “Why did you do that?” And she grabbed the nutcracker and the broken-off piece its jaw and ran off to find their mother. But what could her mother do? All she could do was to hug Clara and promise that Godfather Drosselmeyer would make the nutcracker as good as new in the morning. It was funny, but now that the nutcracker-soldier was damaged, Clara felt sorry for it, and even though it had an ugly face, she began to love it as much as if it were the most beautiful doll in the world. And when Clara went to lay it under the Christmas tree, she felt so sad that she lay down and held the broken solider closely to her. She cried a little, and soon she fell asleep among the presents. And if you came into the room just then, you might have thought that Clara herself was a big doll, like the others flopped under the tree. At midnight, the 12 chimes of the grandfather clock roused Clara from her sleep. She sat up and wondered for a where she was. And as she looked up she saw Godfather Drosselmeyer sitting on the very top of the tree in the place of the angel. “Godfather ! What are you doing up there? ” she said. But he did not answer, because he was just a doll. And then she saw the nutcracker. Oh, how sad it looked, lying there with a piece missing. But then the nutcracker-soldier turned over… and it smiled at her with its broken face. She screamed and started to run for the door. But she had only taken a few steps when she saw that the whole floor in front of her was covered with mice – only they weren’t ordinary mice because they were dressed as soldiers and they had swords and rifles. Out in front they were lead by a terrible rodent with seven heads, each with a golden crown on it. I think that anyone can get a fright from a mouse – they are so small and squeaky, but at the same time they appear out of holes and cracks so suddenly that they catch us by surprise. But an army of mice! And a Seven-headed Mouse-King. This was a terrible sight indeed ! Perhaps I don’t need to tell you that Clara let out a scream ! But before she could scream, or cry , or run, the Nutcracker Doll rushed forward followed by his own army of dolls and tin soldiers, and the battle between the toys and the mice broke out all around Clara’s feet. The mice squeaked and guns and cannons fired on both sides. Clara wondered why the whole family was not awoken by the noise. Toys and mice lay wounded on all sides, and the nutcracker was fighting with the Mouse King. The Mouse King was biting the nutcracker with his seven heads, but the nutracker fought on – if only he was not broken he could have caught the Mouse King in his jaws, but as it was, all he could do was to dance, jump, and kick with his long legs. He was winning the fight with the King, but losing the battle, for he was surrounded by mice solders who caught him by the feet and started to drag him away. “Oh no you don’t !” screamed Clara, “and she took off her shoe and threw it as hard as she could at the Mouse King. She just missed him, but he took fright and started to run. When the army of mice saw their king running from a giant girl and her flying shoes they turned and fled in terror. In a moment they had vanished into the cracks between the floor boards, leaving their prisoner, the nutcracker, behind them. All the toys cheered and began to dance, until at least, when the first light came through the window they crept back into the toy box, or went back to sleep under the Christmas tree. And Clara pulled herself back to her own room and fell into a deep sleep. “Thank you so much dear Godfather,” said Clara. “He’s the best present I ever had.” And then she told him all about her strange dream. And her Godfather put his head on one side, while he listened to her dream, and when she had finished telling him, he said. And this is the story that he told Clara. The Queen screamed, and her guards rushed in to the room with drawn swords – but the Mouse Queen had disappeared behind the skirting board. It so happened that the King and Queen had a beautiful daughter called Princess Pirlpat. When The king heard about the threats of the Mouse-Queen, he ordered bed of the princess must be guarded by seven fierce cats so that no mouse could get near her. But even cats must sleep. And when they were curled up and purring softly, the Queen Mouse crept past them and climbed up on to the end of Princess Pirlpat’s cot. There she said an evil magic spell, and in the morning, when she looked in the mirror, she saw that her face had been turned quite, quite ugly. Her nose was long and had a wart on the end of it, her eyes were small and squinty, her hair was standing up on end and would not settle down, she had spots on her chin. In fact, she wasn’t just ugly. She was hideous. As you can imagine, the Queen was utterly distraught – and the King, well he was beside himself. He summoned Drosselmeyer again and gave him just four weeks to find a cure for the princesse’s ugliness – or else. But Drosselmeyer was an inventor, not a magician. He did not know any spells or anti-spells. He did not know what to do, and so he asked the Court Astrologer for his advice. And the advice he received was that Princess Pirlpat must eat a nut called a Crakatook. But first the Nut must be cracked by a boy who had never shaved, and he must do it without opening his eyes, and then he must take seven steps backwards without stumbling. Well Drosselmeyer searched the land for a Crakatook nut, and eventually, after almost four weeks were up, he found one in a small shop. He brought it before the King. “This nut sire, ” he said, “is the cure for your daughter’s ugliness. She must eat it. But first the nut must be cracked by a boy who has never shaved, and he must do it with his eyes closed, and then he must take seven steps backwards without stumbling”. The King was pleased that the cure for his daughter was so straight forward. He made a law that that any boy who fulfilled the conditions and cured his daughter of ugliness would have the hand in marriage of the princess. And many boys came to the palace and tried to crack the nut. But not one could succeed. Until one day, Drosselmeyer’s own nephew was visiting his uncle in the palace. His face was still smooth, he had not quite reached the age when he needed to shave, and his uncle asked if he would like to try his hand at cracking the nut. And the nephew held the nut between his teeth. And he closed his eyes. And he cracked it. Then he took seven steps backwards, and on the seventh step — he stumbled. And although Princess Pirlpat was cured of her ugliness, and was beautiful once more- Drosselmeyer’s nephew caught the spell – and his face became ugly. In place of his nice kind mouth, he wore a stupid grin, and his smooth cheeks grew a white curly beard. And his head grew too large for his shoulders. And he looked not only ugly, but stupid too. And although the King had promised that his daughter would marry the boy who cured her, his daughter refused to marry one who was so ugly. And the king had to agree that it would not be proper for the princess to marry such an ugly, stupid-looking boy. And as Drosselmeyer’s nephew went home, people pointed and laughed at him. His teacher said he could no longer come to school because he looked so stupid. And so he stayed at home, all alone. And that was the story that Godfather Drosselmeyer told to Clara. And she thanked her Godfather for telling her such an interesting story, but she had to admit that it had made her feel rather sad. That night Clara was thinking about the strange tale, and she could not fall asleep. After a long while of laying awake, she heard a voice whispering in her ear. And Clara was so afraid for the nutcracker that she got up and found some sweets for the Mouse king. He gobbled them up with this seven heads in an instance, and then he demanded more. And she went down the the pantry and found some cake – and he ate all of that too – and the Christmas pudding – and the newly baked biscuits. And still he wanted more. And Clara began to cry – for what would her mother say in the morning when she found that all the sweets, cake and biscuits in the house had been eaten? “We know! We know!” chirped the Sparrows. 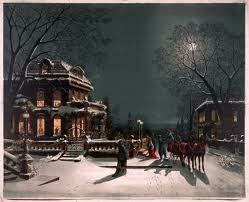 “We have peeped in at the windows in the town below! We know whither they are taken! The greatest splendor and the greatest magnificence one can imagine await them. We peeped through the windows, and saw them planted in the middle of the warm room and ornamented with the most splendid things, with gilded apples, with gingerbread, with toys, and many hundred lights! But the Tree did not rejoice at all; he grew and grew, and was green both winter and summer. People that saw him said, “What a fine tree!” and towards Christmas he was one of the first that was cut down. The axe struck deep into the very pith; the Tree fell to the earth with a sigh; he felt a pang–it was like a swoon; he could not think of happiness, for he was sorrowful at being separated from his home, from the place where he had sprung up. He well knew that he should never see his dear old comrades, the little bushes and flowers around him, anymore; perhaps not even the birds! The departure was not at all agreeable. The Tree only came to himself when he was unloaded in a court-yard with the other trees, and heard a man say, “That one is splendid! We don’t want the others.” Then two servants came in rich livery and carried the Fir Tree into a large and splendid drawing-room. Portraits were hanging on the walls, and near the white porcelain stove stood two large Chinese vases with lions on the covers. There, too, were large easy-chairs, silken sofas, large tables full of picture-books and full of toys, worth hundreds and hundreds of crowns–at least the children said so. And the Fir Tree was stuck upright in a cask that was filled with sand; but no one could see that it was a cask, for green cloth was hung all round it, and it stood on a large gaily-colored carpet. Oh! how the Tree quivered! What was to happen? The servants, as well as the young ladies, decorated it. On one branch there hung little nets cut out of colored paper, and each net was filled with sugarplums; and among the other boughs gilded apples and walnuts were suspended, looking as though they had grown there, and little blue and white tapers were placed among the leaves. Dolls that looked for all the world like men–the Tree had never beheld such before–were seen among the foliage, and at the very top a large star of gold tinsel was fixed. It was really splendid–beyond description splendid. He knew very much about the matter–but he was so impatient that for sheer longing he got a pain in his back, and this with trees is the same thing as a headache with us. The candles were now lighted–what brightness! What splendor! The Tree trembled so in every bough that one of the tapers set fire to the foliage. It blazed up famously. “Ivedy-Avedy,” cried some; “Humpy-Dumpy,” cried the others. There was such a bawling and screaming–the Fir Tree alone was silent, and he thought to himself, “Am I not to bawl with the rest? Am I to do nothing whatever?” for he was one of the company, and had done what he had to do. And the man told about Humpy-Dumpy that tumbled down, who notwithstanding came to the throne, and at last married the princess. And the children clapped their hands, and cried. “Oh, go on! Do go on!” They wanted to hear about Ivedy-Avedy too, but the little man only told them about Humpy-Dumpy. The Fir Tree stood quite still and absorbed in thought; the birds in the wood had never related the like of this. “Humpy-Dumpy fell downstairs, and yet he married the princess! Yes, yes! That’s the way of the world!” thought the Fir Tree, and believed it all, because the man who told the story was so good-looking. “Well, well! who knows, perhaps I may fall downstairs, too, and get a princess as wife! And he looked forward with joy to the morrow, when he hoped to be decked out again with lights, playthings, fruits, and tinsel. “I won’t tremble to-morrow!” thought the Fir Tree. “I will enjoy to the full all my splendor! To-morrow I shall hear again the story of Humpy-Dumpy, and perhaps that of Ivedy-Avedy too.” And the whole night the Tree stood still and in deep thought. “Now then the splendor will begin again,” thought the Fir. But they dragged him out of the room, and up the stairs into the loft: and here, in a dark corner, where no daylight could enter, they left him. “What’s the meaning of this?” thought the Tree. “What am I to do here? What shall I hear now, I wonder?” And he leaned against the wall lost in reverie. Time enough had he too for his reflections; for days and nights passed on, and nobody came up; and when at last somebody did come, it was only to put some great trunks in a corner, out of the way. There stood the Tree quite hidden; it seemed as if he had been entirely forgotten. “Squeak! Squeak!” said a little Mouse, at the same moment, peeping out of his hole. And then another little one came. They snuffed about the Fir Tree, and rustled among the branches. “I!” said the Fir Tree, thinking over what he had himself related. “Yes, in reality those were happy times.” And then he told about Christmas-eve, when he was decked out with cakes and candles. “What delightful stories you know,” said the Mice: and the next night they came with four other little Mice, who were to hear what the Tree recounted: and the more he related, the more he remembered himself; and it appeared as if those times had really been happy times. “But they may still come–they may still come! Humpy-Dumpy fell downstairs, and yet he got a princess!” and he thought at the moment of a nice little Birch Tree growing out in the woods: to the Fir, that would be a real charming princess. “Who is Humpy-Dumpy?” asked the Mice. So then the Fir Tree told the whole fairy tale, for he could remember every single word of it; and the little Mice jumped for joy up to the very top of the Tree. Next night two more Mice came, and on Sunday two Rats even; but they said the stories were not interesting, which vexed the little Mice; and they, too, now began to think them not so very amusing either. But when was that to be? Why, one morning there came a quantity of people and set to work in the loft. The trunks were moved, the tree was pulled out and thrown–rather hard, it is true–down on the floor, but a man drew him towards the stairs, where the daylight shone. “Now a merry life will begin again,” thought the Tree. He felt the fresh air, the first sunbeam–and now he was out in the courtyard. All passed so quickly, there was so much going on around him, the Tree quite forgot to look to himself. The court adjoined a garden, and all was in flower; the roses hung so fresh and odorous over the balustrade, the lindens were in blossom, the Swallows flew by, and said, “Quirre-vit! 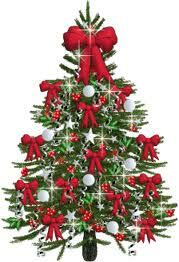 My husband is come!” but it was not the Fir Tree that they meant. “Now, then, I shall really enjoy life,” said he exultingly, and spread out his branches; but, alas, they were all withered and yellow! It was in a corner that he lay, among weeds and nettles. The golden star of tinsel was still on the top of the Tree, and glittered in the sunshine. “Only look what is still on the ugly old Christmas tree!” said he, trampling on the branches, so that they all cracked beneath his feet. The boys played about in the court, and the youngest wore the gold star on his breast which the Tree had had on the happiest evening of his life. However, that was over now–the Tree gone, the story at an end. All, all was over–every tale must end at last.